White. Pure white. Pure indulgence. Leftovers have never been so good. Or so fattening. This is NOT a diet recipe in any way, shape or form. What it is, is rich, creamy and a little on the decadent side. It’s a bonus that it is amazingly quick and it uses leftover chicken or turkey. My American friends, Thanksgiving is coming up. This is one recipe that will earn raves and will help you get some of that leftover bird out of the refrigerator or freezer. Sautéed onion and garlic – but not browned. Usually when I crave rich dishes the weather is chilly and I’m in need of some comfort food. Not the case the day I made this. 10 places in Nova Scotia broke temperature records. When I looked at the thermometer it said 23°C. That’s pretty darned warm for the middle of November. Regardless of from where the desire arose, I’m glad it came. This was smooth, creamy, cheesy and delicious. Only a few ingredients too. 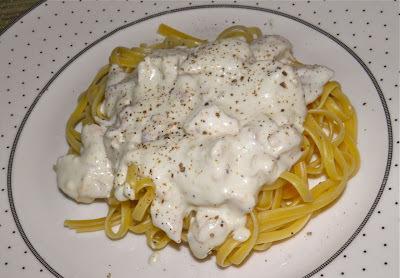 This was the first time I had used cream cheese in an Alfredo sauce. It certainly increased the "cheesy" flavour. If you ever find you have some pre-cooked poultry just hanging around and don’t know what to with it remember this recipe. Even without the chicken (or turkey) this Alfredo sauce would be a crowd pleaser. To toss with pasta I think I would keep the cream cheese to 3/4 of a package. It can get pretty thick. Since there was only two of us, we now have leftover ”leftovers.” Watch out, tomorrow’s lunch! This sauce would be great with or without chicken. Melt the butter in a sauté pan. 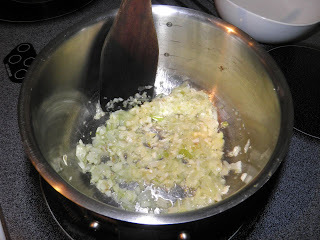 Add the chopped onion and garlic and let cook over medium heat until softened, about 3-4 minutes. Do not brown. Add the chicken stock and bring to a simmer. Let boil for 3-4 minutes. Remove from the heat and purée the mixture with a blender or stick emulsifier. Return the pan to the heat and add 3/4 of the cream cheese. Whisk until well blended. Add the parmesan and whisk in. 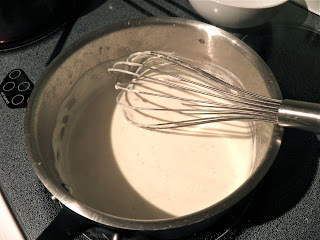 If the sauce isn’t thick enough for your liking, add some more of the cream cheese and whisk until smooth. If it is, add the pepper and chicken. Stir and let the mixture heat through. Taste for salt and adjust. Serve on freshly cooked linguini.